Radiant heat flux that is incident upon a heat flux transducer is always partially reflected. The signal produced by the transducer represents only the absorbed heat flux, since reflected energy does not enter the signal generation process. If the absorptivity of the transducer surface were exactly known, calibrations could be in terms of absorbed heat flux. However, the absorptivity is not accurately known. Furthermore, calibrations must be in terms of something which can be accurately measured. This is the incident heat flux. 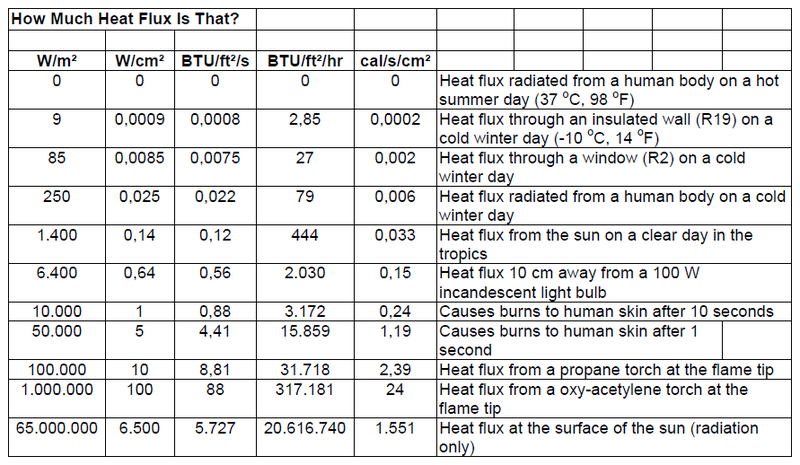 All known standards for heat flux; those based on radiometric measurements and those based on temperature measurements, are in terms of incident heat flux. To calibrate a heat flux transducer, we illuminate it with a source of radiant energy whose incident heat flux at the surface of the transducer is accurately known. We measure the output signal of the surface of the transducer with one or more values of incident heat flux. The sensitivity and scale factor of the transducer are then calculated, based on incident heat flux and the signal it produces. As long as the coating on the surface of the transducer is not changed, the relationship between incident heat flux and output signal will remain the same. However, if the coating is removed, worn away, sooted up, or if the transducer is re-coated, the calibration will no longer be valid. This is because the absorptivity of the coating, while not known accurately, is a factor in the sensitivity of the transducer. When a heat flux transducer is used for convective or conductive measurements, there is no reflection process. All of the heat flux that passes through the front surface of the transducer also passes through the measuring element. It would be erroneous to use the sensitivity and scale factor values derived from a radiative calibration for these two modes of heat transfer. Instead, the values of sensitivity and scale factor must be modified. The radiative sensitivity is divided by the emissivity (» absorptivity) to derive a conductive/convective sensitivity. The scale factor of the transducer is multiplied by the emissivity. The sensitivity and scale factor derived in this way are correct even if the surface of the transducer is changed, because they are based on the original calibration and the original coating. How much heat flux is that? A heat flux sensor typically consists of a thermopile or sometimes just a pair of thermocouples in which the elements are separated by a thin layer of thermal resistance material. Under a temperature gradient, the two thermopile junction layers will be at different temperatures and will therefore register a voltage. The heat flux is proportional to this differential voltage. Note that there must be a temperature gradient; if there is none, both thermocouple junction layers will be at the same temperature and hence register no voltage. The thermal resistance layer is usually made as thin as possible to improve the sensor's response time. To help ensure a proper thermal gradient, heat flux sensors should be designed to have a high thermal conductivity. thermoresistances and other temperature sensors supply. Probe for residual chlorine measurements in potabilization systems. Planting chlorine residue cell for purifying plants. Megaohm resistivity meter for measurements in ultrapure waters for use in electronics.